Evenly illuminate flat, shiny surfaces. The Microscan Smart Series DOAL Illuminators (Diffuse On-Axis Light) provide diffuse, uniform illumination for flat specular surfaces. With the coaxial lighting approach, specular surfaces perpendicular to the camera appear bright, while surfaces surfaces which are marked or embossed absorb light and appear dark. By providing greater uniformity than conventional sources, Smart Series DOAL Illuminators increase machine vision accuracy and repeatability. 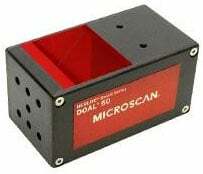 The Microscan NER-011660520G is also known as Microscan Systems	NER-011660520G	or NER011660520G	.